Bernard W. Taylor, III received the PhD and MBA from the University of Georgia and a BIE from the Georgia Institute of Technology. He has served as President of the Decision Sciences Institute and as a member of its Executive Committee and Board of Directors. He also served as the Program Chair for the 1988 National Decision Sciences Institute (DSI) Meeting in Las Vegas, Associate Program Chairman, Council Member, Vice-President, Treasurer, and as the Editor of Decision Line, the newsletter of DSI. He was named a Fellow of DSI in 1984. He is a past President, Vice-President, and Program Chairman of the Southeast Decision Sciences Institute. In 1991 he was the recipient of the Distinguished Service Award from DSI, and in 1984 he received the Distinguished Service Award for Southeast DSI. He is author of the book Introduction to Management Science (Pearson, 12th edition), and co-author of Operations Management (Wiley, 9th edition), and, Management Science (W.C. Brown, 4th edition). 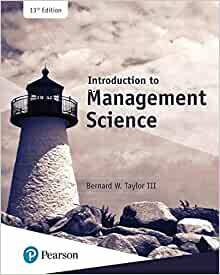 Dr. Taylor has published numerous articles in such journals as Operations Research, Management Science, Decision Sciences, IIE Transactions, Journal of the Operational Research Society, Computers and Operations Research, Omega, and the International Journal of Production Research, among others. In 1984 he received the Stanley T. Hardy Award for the greatest contribution to the field of production and operations management for his paper in Decision Sciences (with Huang and Rees) on the Japanese kanban production system. He has also served on the editorial boards of the Journal of Operations Management, Production and Operations Management, Journal of Management, the Review of Business and Economic Research, and Computers and Operations Research. Taylor's research and teaching interests are in the areas of management science applications and operations management. He has received the University Certificate of Teaching Excellence on four occasions and the College of Business Teaching Excellence Award once. In 1989 he was awarded the College of Business PhD Teaching Excellence Award. He served as Head of the Department of Business Information Technology from 1983 to 2017. I am using this for school. It came it great condition!